At long last, the next (and possibly final) entry in one of the most beloved video game franchises of all time is here. Needless to say, we're pumped. You should be too. Metal Gear Solid V: The Phantom Pain finally came out yesterday. And we're not the only ones who are excited. It's a Japanese game, but they depict Americans pretty accurately. If you're like us, you've been getting into the spirit for a while. ... and Hideo. Based Hideo Kojima. Konami tried to wipe Hideo Kojima from the project. Even though if it weren't for him, the Metal Gear series would have never happened. He's the brains behind the entire operation, and because Konami is shifting its business model to focus more on producing mobile games (yuck), they decided to part ways with Kojima and his studio, Kojima Productions. If The Phantom Pain is your first Metal Gear game, then let's have a little history lesson. This is your protagonist. He goes by many names: Punished Snake, Venom Snake, Naked Snake, John, Jack, or simply Snake. But you can call him by his most popular name: Big Boss. He's been in nearly every Metal Gear game so far, as both a protagonist and an antagonist, and is the father of Metal Gear Solid 4 protagonist Solid Snake. Big Boss is a badass. So much so, he doesn't even have to use his good eye to aim. And before you call "error" or "mistake," this is actually a real phenomenon called occluded eye aiming, where skilled marksmen can adjust their depth perception to merge what they see with both eyes into a single perspective. Basically, Big Boss doesn't even need a second eye. He's a responsible man, always being the designated driver. Also he lights cigars like a badass. At the start of The Phantom Pain, Big Boss has been in a coma for 9 years since 1975. He wakes up on March 11, 1984, being confronted by this bandaged man... and that's all we're telling you! You're just going to have to jump into the game and figure the rest out for yourself! Just be glad you're not this guy. Naturally, the game has inspired huge amounts of artwork, including custom '80s themed posters. The game checks your console or PC bio to see if you've entered in your birthday anywhere. 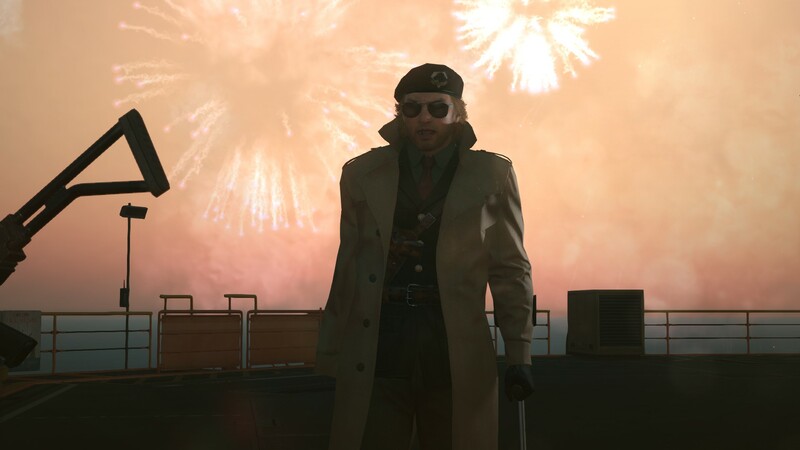 If you have, and it's your birthday, Mother Base throws you a little birthday party. ... and, of course, a birthday cigar. If a game throwing you a birthday party isn't enough to get you to play it, then I don't know what is.